Lesotho is a landlocked country entirely surrounded by South Africa. Previously called Basutholand, a kingdom formed under King Moshoeshoe I in 1822, it became a British protectorate in 1868, and then came under direct British colonial rule in 1870. It gained independence in 1966 as the Kingdom of Lesotho. Since independence, Lesotho has seen a number of governance changes and episodes of civil, political and military unrest. Currently Lesotho is a constitutional monarchy with a king and a democratically elected parliament and prime minister, but there are still periodic episodes of unrest. Lesotho’s economy is highly integrated with that of South Africa. Nearly two thirds of the country’s income comes from arable and livestock agriculture, although agricultural production has declined in the past half century. Over this period mining, mainly of diamonds, and manufacturing, mainly of garments, have grown in importance. The textile industry employs more people – mostly women – than the government sector. Tourism has grown since the 1990s, helped by increasing modernisation. Remittances from migrants, working largely in South African mines, have also been important historically and remain so today. Surface water is a key natural resource, tapped for hydroelectricity by the large Lesotho Highlands Water Project. Lesotho sells this electricity as well as water to South Africa. The global economic crisis of the last decade has reduced export income from diamonds and textiles. Over a quarter of the population is HIV positive, which is one of the major development issues being tackled by the government. Lesotho, a highland country, has relatively abundant surface water resources, which are a key resource for water supply and hydroelectricity. Groundwater makes up a relatively small proportion of total water use in the country, but is relied upon for rural water supplies, from springs and boreholes or hand dug wells. Please cite this page as: Leketa, Migwi, Crane, Upton, Ó Dochartaigh and Bellwood-Howard, 2018. Lesotho. Map developed from USGS GTOPOPO30; GADM global administrative areas; and UN Revision of World Urbanization Prospects. For more information on the map development and datasets see the geography resource page. More information on average rainfall and temperature for each of the climate zones in Lesotho can be seen at the Lesotho climate page. The surface water hydrology of Lesotho is defined by three major rivers: Mohokare in the far west; Makhaleng in the central area; and Senqu in the far east. These rivers converge to form the Orange-Senqu River in South Africa, which flows eastwards to the Atlantic Ocean. The Hydrology Division of the Department of Water Affairs is responsible for river flow gauging and data management. There are 69 operational river flow monitoring stations country-wide. In addition, water levels at the Katse, Mohale and Muela Dams, and releases from these dams, are monitored by the Lesotho Highlands Development Authority (LHDA) (Commissioner of Water 2013). Limited monitoring specific to the Lesotho Highlands Water Project area is also carried out by the LHDA (Commissioner of Water 2013). However, the Department of Water Affairs remains the depository of all surface water data in Lesotho. Major surface water features of Lesotho. Map developed from World Wildlife Fund HydroSHEDS; Digital Chart of the World drainage; and FAO Inland Water Bodies. For more information on the map development and datasets see the surface water resource page. 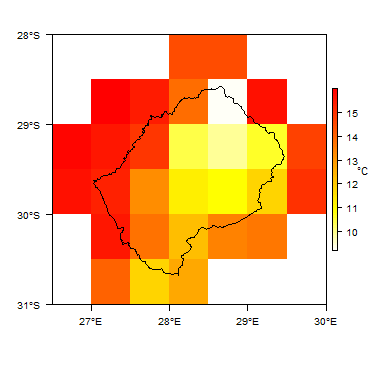 Soil Map of Lesotho, from the European Commission Joint Research Centre: European Soil Portal. For more information on the map see the soil resource page. 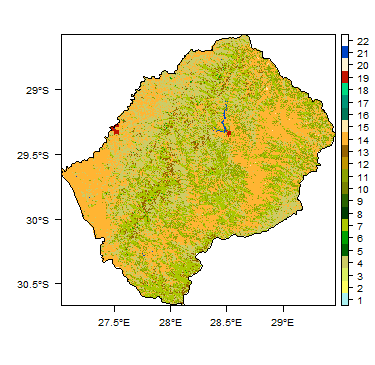 Land Cover Map of Lesotho, from the European Space Agency GlobCover 2.3, 2009. For more information on the map see the land cover resource page. The following section provides a summary of the geology of Lesotho. More detailed information can be found in the key references listed below: many of these are available through the Africa Groundwater Literature Archive. Geology of Lesotho at 1:5 million scale. Developed from USGS map (Persits et al. 2002). For more information on the map development and datasets see the geology resource page. Lesotho Formation (Drakensberg Group) Jurassic Massive basalts which overlie the sedimentary rocks of the Karoo Group. 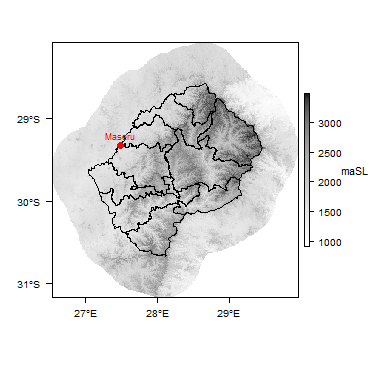 Reaches thickness of 1600m at Mount-aux-Sources in the north of Lesotho (Schmitz and Rooyani 1987). Dolerite intrusions Jurassic Numerous dykes cross the country in two dominant directions: NW-SE and NNE-SSW. Most dykes are near vertical, plate-like bodies, but some dip as shallowly as60° (Schmitz and Rooyani 1987). Some dykes cut across all geological formations and others die out within the basalts. Sills (plate-like, near-horizontal intrusions) occur in older Karoo sedimentary strata, especially in the southwest of Lesotho. Zone I: thickly to very thickly bedded, light brown and light red, very fine grained sandstone, silty sandstone and sandy siltstone. Zone II: alternating beds of massive and cross-bedded sandstone. Zone III: massive to very thickly bedded, very fine grained sandstone to massive silty sandstone, sandy siltstone and siltstone. Thickness from 15 to 250m. Outcrops in the form of plateaux in the lower foothills and as cliffs overlooking the lowlands. Elliot Formation (Red Beds) (Stormberg Group) Late Triassic to Early Jurassic Underlies the Clarens Formation and characterised dominantly by red and purple mudstones and shales and medium to fine grained sandstones. The strong red and purplish coloration differentiates it from the underlying Molteno Formation and from the white and cream coloured overlying Clarens Formation. The transition from the underlying Molteno Formation to the Elliot Formation is gradual, indicating continuous sedimentation. Thins from a maximum of 250m in the south to 15m in the north. Molteno Formation (Stormberg Group) Late Triassic to Early Jurassic White arkosic grits and gritty sandstones, mainly pebbly, with occasional thin shaly sandstones and bluish mudstone (Schmitz and Rooyani 1987). The Molteno Formation underlies the whole of Lesotho and outcrops in the lowlands, where it comprises up to 50m of massive, coarse sandstone. Thins out northwards (Schmitz 1984): from 35m in the north to 150m in the south. The following section provides a summary of the hydrogeology of Lesotho. More detailed information can be found in the key references listed below: many of these are available through the Africa Groundwater Literature Archive. A more detailed hydrogeological map is produced by the Department of Water Affairs (Arduino and Del Sette 1994). Lesotho is also covered by the SADC hydrogeological map and atlas (2010), available through the SADC Groundwater Information Portal. 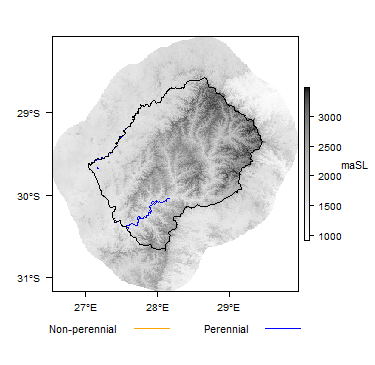 Alluvial deposits There are a small number of unconsolidated aquifers in Lesotho in which boreholes can yield from 10 l/s to 40 l/s (Arduino et al. 1994). They consist of gravelly to sandy ancient alluvial deposits and are usually found at the banks of major rivers or on a former river course. One well known is the Maputsoe-Nyenye aquifer in the north of Lesotho. Lesotho Formation Generally of low permeability due to the massiveness of the basalt rocks. Drilling evidence supports this. Numerous springs occur at almost all levels, originating from weathered sections of the basalt near dykes, interflow zones and at the contact zone between the basalts and the metamorphosed top of the underlying, very low permeability Clarens Formation. They have low sustainable yields. 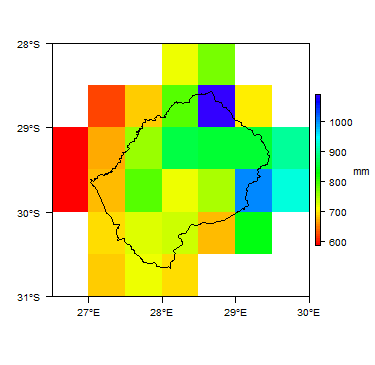 However, in higher permeability weathered zones near dykes, sustainable borehole yields can reach 1.5 l/s (DWA database). The aquifer is semi-confined. Boreholes are typically drilled up to 80m depth. Small yields. Bypass flow through fractures may be a significant proportion of recharge. Dolerite dyke-related aquifers The wider dolerite dykes (wider than 50m) have significant gabbro content below a depth of about 10m, which can act as a barrier to groundwater flow. This can also be the case for narrower dykes which have a massive fabric. Many dykes are 2 to 20m wide, comprising basalt or dolerite, and some of these may be fractured to depths of 30m to 40m and consequently have high permeability compared with surrounding strata. These may form localised aquifers (Schmitz and Rooyani 1987). The most hydrogeologically significant feature of the dykes is the contact zone between dyke and parent rock. This is because the intrusion of the dykes caused some induration and fracturing of the surrounding country rock along the contact zone. This is known as the “baked zone”, which is highly permeable and forms dyke-related aquifers. The extent of the "baked zone" depends on the intrusion temperature, thickness and dip of the dyke and on the nature of the country rock at the contact (Schmitz and Rooyani 1987). Boreholes can give blowout yields of up to 10 l/s and sustainable yields of up to 4 l/s. Numerous pumping test results have shown that, although dykes are very permeable, their storage capacity is generally low. Good yields are usually found within 0.5m from the dyke (Schmitz and Rooyani 1987). Dyke-related springs are usually perennial and strong, frequently discharging at the lowest topographical outcrop of a dyke, such as a stream bed. Discharges of up to 2 l/s (DWA) have been measured. The dissolved solids content can be as much as 350 mg/L (Schmitz and Rooyani 1987). This aquifer is semi-confined. Boreholes are drilled up to 80 m depth. The Clarens, Elliot, Molteno and Burgersdorp Formations form sedimentary rock aquifers. The sandstone layers within these formations are the key aquifers. These sandstone layers vary in grain size, shape, packing and degree of cementation and, therefore, vary in their permeability. The primary porosity, storage and transmissivity of groundwater in the sedimentary rock aquifers is generally relatively low. Secondary porosity (fracturing) created by igneous intrusions has improved permeability (Lesupi). Clarens Formation This is a minor aquifer due to fine grain size and correspondingly low porosity, which averages 2.5% (Schmitz and Rooyani 1987). Groundwater discharge occurs via many seasonal springs at the base of the cliffs, derived from groundwater flows through fractures in the Clarens Formation that emerge at the junction with the shales and even lower permeability sandstones of the underlying Elliot Frmation. Boreholes drilled in this formation, if not dry, have low yields of ~0.1 l/s (DWA Database). The Clarens Formation is confined in some areas where the Lesotho Formation overlies it, but elsewhere it can be said to be semi-confined. Boreholes drilled in this formation, if not dry, have low yields of 0.1 l/s (DWA Database) The low permeability metamorphosed top of the Clarens Formation does not favour recharge to the aquifer. Recharge occurs through fractures. Elliot Formation This Formation is not a particularly good aquifer. A critical factor appears to be the sandstone/shale ratio, which must be approaching unity for a good supply borehole. There is a reported porosity of 25% (Bonny 1975). Tests show that many boreholes drilled in this formation yield from 0.1 l/s to 0.2 l/s, with specific capacity values close to 0.05 l/s/m after 1 hour and 0.02 l/s/m after 24 hours (Schmitz and Rooyani 1987). Very few springs occur in this formation, and any springs have low yields: wet season spring discharges may be 0.05 l/s (Lesupi). Molteno Formation This formation is regarded as the best aquifer in Lesotho. The base of the Molteno Formation forms a spring line, and within the formation, stratified variations in permeability produce additional springs, some of which are perennial and high yielding. Boreholes drilled in this formation have safe yields that vary from 0 l/s to 1.6 l/s with specific capacity values averaging 1.9 l/s/m after 24 hrs (Schmitz and Rooyani 1987). During the dry season, spring yields of 0.5 l/s can be obtained. Burgersdorp Formation This formation is not a good aquifer. The sandstone/shale ratio is very low. Boreholes drilled into this formation are usually dry. Boreholes close to dykes or cut through dykes, which are weathered and more permeable, have a mean yield of 1.16 l/s and a mean specific capacity of 1.12 l/s/m after 24 hrs (Schmitz and Rooyani 1987). According to TAMS Consultants (1996) the total renewable groundwater resource in Lesotho is 10 m³/s. This information has not been updated since. Key groundwater quality issues in Lesotho are naturally occurring contamination by iron, manganese and fluoride. There are plenty of wetland areas on the Mountain plateaux of Lesotho which form small bogs also known as sponges. The bogs have diameters ranging from 50 to 250 m. they occupy surface depressions and therefore accumulate water where underground is impermeable. They are major sources of rivers in Lesotho. The major uses of groundwater are industrial, and domestic use in the rural communities. Towns and cities that depend entirely on groundwater resources include: Maputsoe, Roma, Mapoteng, Peka, Thaba Tseka and Morija. Other cities, such as Quthing, Mafeteng, and Maseru, entirely depend on surface water resources. 11.4% of Lesotho's water supply is from groundwater (information from WASCO and DRWS databases). NB: A gravity system consists of a captured spring upslope of a community, from where water is piped to an outflow downslope. A water point consists of a captured spring, usually downslope of a community, where a tank is constructed at the spring and fitted with a tap. This is usually done where there is no power to pump water upslope to the community. The key groundwater management institution in Lesotho is the Department of Water Affairs (DWA). The DWA's Groundwater Division is responsible for assessing and managing groundwater resources, through hydrogeological surveys, borehole construction, aquifer tests and monitoring. The Water Act 2008 provides for the management, protection, conservation, development and sustainable utilisation of water resources. Permits are required for drilling a borehole (Construction Permit) and for using groundwater (Water Use Permit); these are granted by the Water Rights Division of the DWA. Lesotho shares an aquifer with the Republic of South Africa. There is no joint groundwater monitoring of this aquifer. The Lesotho/South Africa Karoo Aquifer was used as an example of transboundary aquifers in a paper by Cobbing et al. (2008): A critical overview of transboundary aquifers shared by South Africa. The Groundwater Division of the DWA monitors groundwater levels in 72 boreholes and flows at 162 springs. These are monitored on a biannual basis, in dry and wet seasons. There are also selected key springs and boreholes in each district which are monitored on a monthly basis. The data are stored in the Departmental database. Many of the documents below, and others relating to the hydrogeology of Lesotho, can be found in the African Groundwater Literature Archive. Lesotho Government. 1982. Geological Map of Lesotho, Scale: 1:250 000. Government of the United Kingdom (Directorate of Overseas Surveys) for the Government of Lesotho. UNDP. 1984. Geology and Mineral Resources of Lesotho. Exploration for Diamonds (phase 1) and Exploration for Minerals (Phase 2). Technical report DP/UN/LES-71-503/8 and DP/UN/LES-73-021/9. For the Government of Lesotho. Arduino G, Bono P and Del Sette, P. 1994. 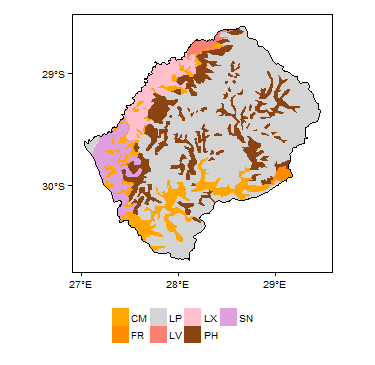 Hydrogeological Map of Lesotho, Scale: 1:300 000. Government of Italy General Directorate of Development Cooperation MOLISV-Groundwater Project and Government of Lesotho Ministry of Natural Resources Department of Water Affairs, Groundwater Division. Commissioner of Water. 2013. State of Water Resources Report April 2011-March 2013. This page was last modified on 18 February 2019, at 17:28.